All things nautical feature in this vintage-style design. Within the ship's wheel is a diving suit, a compass, a Galleon ship and a Seagull watching over the waves. The corners of the design are adorned with navigation tools, a telescope and snippets of an explorers maps. 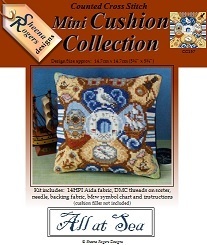 Only whole cross stitch is required throughout, along with backstitch for the finer details.